Almost immediately I recognised This Space as my true home, a miraculous release into a limitless expanse in which writing could be explored in the direction demanded by the work under discussion. The editorial identity was soon established and gave me what I had lacked until then. My only responsibility was to sustain that exploration. Perhaps ten years suggests a certain relentlessness, an unwillingness to develop going forward. To which I respond: "Blogging is a singular project because it goes nowhere and can only keep going in that direction". In the relaxed confines of the LRB Bookshop on a warm August evening, Lars Iyer marked the publication of his fourth novel by telling an audience that as a youngster he had been drawn to philosophy rather than fiction as a means to find a way to live, to think his way to life. It's an old question – how to live? – and one often so pressing that philosophers have made it central to their lives. This indeed used to be the definition of a philosopher: someone who lived consistently with their beliefs. Ludwig Wittgenstein is one example. For his character Wittgenstein Jr, Iyer says philosophy is also "a kind of spiritual progress", with Socrates and Augustine as his own key figures. So why did Iyer himself turn from philosophy to writing fiction? How to live? is a simple question too of course, as light as a falling leaf and easily brushed aside as you join a queue to have your copy signed. Without noticing, you're soon dealing with ephemeral demands and the question is answered for you. Iyer said that by the time he was established as an academic in the subject, teaching and supervising, researching and presenting papers at conferences, publishing books, philosophy itself had been displaced. The pressure of having to justify every turn in an argument with references and footnotes covering all contributions and all angles meant the youthful quest was replaced by bureaucracy and career concerns in which "spiritual progress" equalled redundancy. How then to ask the question again? Fiction marks his answer, a form defined by a lack of pressure, by freedom, so we shouldn't be surprised that the drama of each novel he has written persists in the distressing absence of a philosophy by which to live; a certain weight. In the Spurious trilogy, it is found in the double-act despair of W. and Lars as they float like schlubby cherubim in search of God's anchor while, in Wittgenstein Jr, the drama emerges from the asymmetry of a troubled Cambridge philosophy tutor and his lightweight, hedonistic students. The philosopher perplexes, irritates and fascinates them in equal measure with his silences and gnomic remarks. I will teach you differences. Philosophy stands between us and salvation. They decide he has modelled himself on the real Ludwig Wittgenstein, and so the fun begins. "When will he present an actual argument? – Mulberry's taking bets." After a while the stand-in Wittgenstein becomes more talkative. He implores his students to dispense with Cambridge cleverness and Cambridge pride in order to face the challenge of his philosophical lesson. The anxious silences are due to paranoia. He believes the Cambridge dons are out to destroy him, as he seeks a utopia of "after philosophy" in which "the light on a particular afternoon will be as rich as the collected works of Kant". Cambridge University stands for what obscures such light, it stands for the hegemony of English philistinism, English parochialism, for a landscape flattened by the English steamroller. But never was the English lawn so lush as in the great universities of England! Wittgenstein says. Old expanses of lawn, strewn with meadowsweet and buttercups in high summer. Crocuses blooming in spring. Posh students everywhere. Rah boys in gilets and flip-flops, with piles of bed-head hair. Rugby types, as big as fridges, all red-cheeked health, their voices booming. Rah girls dressed in gym gear and pony-tails. English roses in horse-and-hound clothing, as though fresh from the gymkhana. Yummy-not-yet-mummies in fur-lined Barbour. Ethno-sloanes, with string tops and slouch bags. Sloane-ingénues with big cups of coffee, sweater sleeves half pulled over their hands. But why is it so pleasurable? At first this sounds like the classic and contemptible English light comedy in which characters are ridiculed for the Schadenfreude of harassed commuters, generic personas dancing on the end of the author's strings before a garishly painted state-of-the-nation backcloth. Perhaps because such hyperbole is counterbalanced by Wittgenstein Jr's apocalyptic vision of philosophical rapture. Combined and in opposition they have a peculiar effect on the reader, both ecstatic and deflating, so that even as one savours the possibility of another life, another world, there is also the absurd present. While Iyer convinces us of Wittgenstein Jr's spiritual yearning and captures the aura of his namesake with minimal brush strokes, the madcap students remind us it is of course only a novel and that the characters are inventions, that the stifling conformity of Cambridge is an exaggeration and that Wittgenstein Jr is not Ludwig Wittgenstein. Everything is weightless. But this is also necessary, because lightness enables flight. When Tibor Fischer judged the book "too long" he might have added that such airborne hyperbole is always too long and even one excessive, declaratory fictional sentence might already be too much, popping up like a molehill on the lawn over which the donnish greenkeeper might then stand, tutting. 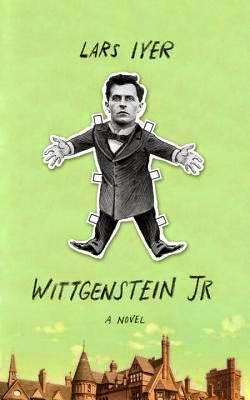 Wittgenstein Jr comes to an end as the carefree life of a student comes to an end. Salvation of a sort is offered to Wittgenstein Jr, but he disappears. A clue to his whereabouts was seen earlier when students go to his room to check on his well-being and spy scraps of paper tacked to the wall with only one word visible: APERION, Anaximander's word for the eternal or cosmological infinity (also spelled "apeiron" but this is how it appears in the novel). Perhaps this is an additional mark of excess to the one Derrida says signifies the participation in a genre without membership, a mark that is itself not part of the genre yet necessary for its distinction and recognition. Aperion then is the mark of a universal principle of existence, an abstraction outside of life that nevertheless makes life possible and is apparently sensible only in the light of a particular afternoon and in the freedom, lightness and excess of writing, and yet which, as Fischer's cavil confirms, must also succumb to the ever-encroaching English lawn. Back in the LRB Bookshop, the event drawing to a close, the audience was given a chance to ask questions. As hands went up and a microphone passed around, I wondered what it would mean for the lightness of fiction to become as heavy as academic philosophy, with its own bureaucracy and career demands, for it to be a kind of spiritual regression, for aperion to be only a word tacked to a wall, and then how a writer might evade the lawn of genre. But I didn't ask the question. Perhaps Wittgenstein Jr's disappearance is the answer.